After the first week of our preseason camp in Lillehammer we have a day off to recover and regroup before hitting the track again in our perpetual pursuit of speed. After the first week of our preseason camp in Lillehammer we have a day off to recover and regroup before hitting the track again in our perpetual pursuit of speed. I’ve taken some of the time off to sit with my laptop on one knee and thesaurus on the other, to expand my vocabularial horizons. 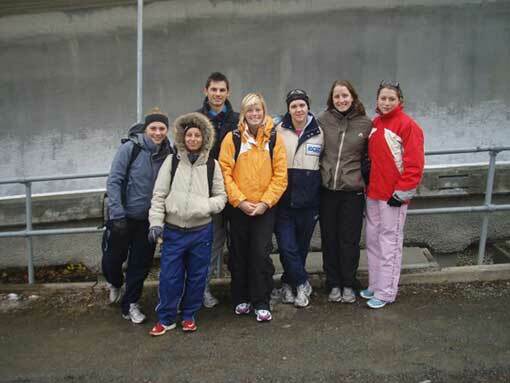 We’re sliding at the track where I was first introduced to skeleton with a group of 8 girls trying to make it onto the British Skeleton talent programme, almost exactly 9 years ago to the day (see picture). Our first week has gone quickly, and on a track that I don’t usually consider one of my strongest tracks the first few days were spent clearing the clouds of sliding amnesia that descend over the summer. There have been brief glimpses of the sliding ability that’s lurking under the surface through the week, but now the clouds have started to clear and I can get into the swing of trying to make the hard work count for the season. The rush of the first run was a sudden reminder of that feeling of speed and fluidity on ice that made me fall in love with my sled when I first got on it two years ago at this track. That was a very different time to this though, back then I was trying to figure out how the sled responded with the awkwardness of a toddler stroking a cat. Now that I’ve spent two years bonding with my sled on tracks all over the world we have an intimacy that’s only rivaled by the familiarity of pensioner couples who take long cruises together and communicate in semi-telepathy. Next week we start the official training runs for our selection races, with the race spread over two days at the end of the week. There have been quick runs coming from all angles across the team, so it looks like it’s gearing up to be a good race.